The west and central African representative/sister taxon of the widespread tropical Asian genus Elymnias. There are sympatric orange- and white-banded forms, which Larsen (2005) suggests are Batesian mimics of male and female Acraea epaea, respectively. The species also bear a resemblance to various Amauris spp. (Danainae). Larvae feed on palms. Historically, the name of this taxon was considered to be Elymniopsis phegea (Fabricius, 1793). 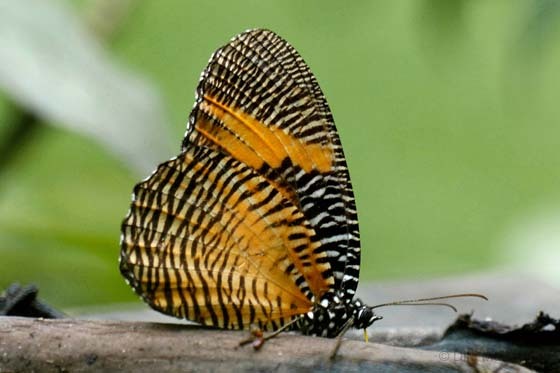 However, Fabricius' name is unavailable, as a junior homonym of Papilio phegea Borkhausen, 1788 (itself currently a subjective junior synonym of Proterebia afra (Fabricius, 1787)). Hemming (1960) proposed the replacement name Elymniopsis lise, not realizing that Westwood (1851) had already given the species another name, Elymnias bammakoo, which therefore takes priority. Larsen, T.B. 2005. Butterflies of West Africa. Apollo Books, Stenstrup, Denmark. Page: Tree of Life Elymniopsis Fruhstorfer 1907. Elymniopsis bammakoo (Westwood 1851). the African Palmfly. Authored by Andrew V. Z. Brower. The TEXT of this page is licensed under the Creative Commons Attribution License - Version 3.0. Note that images and other media featured on this page are each governed by their own license, and they may or may not be available for reuse. Click on an image or a media link to access the media data window, which provides the relevant licensing information. For the general terms and conditions of ToL material reuse and redistribution, please see the Tree of Life Copyright Policies.